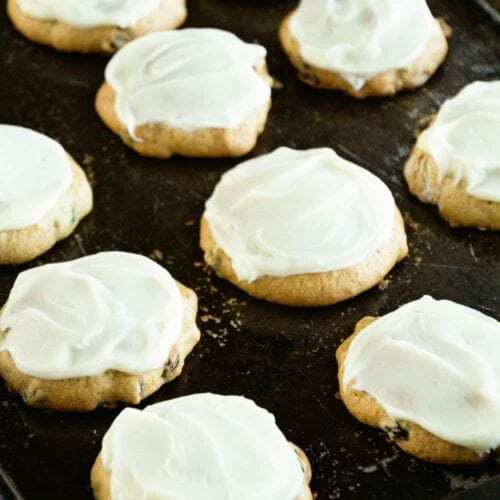 Zucchini Cookies with Cream Cheese Frosting Recipe ~ Soft, Delicious Cookies Stuffed with Zucchini and Raisins then Frosted with Cream Cheese Frosting! I had some zucchini that definitely needed to be used up. Like yesterday. I did the typical Zucchini Bread and I still had some left so I was determined to find something different that I could use it up in. I told my mom I wanted to make pancakes and she didn’t think that sounded good. 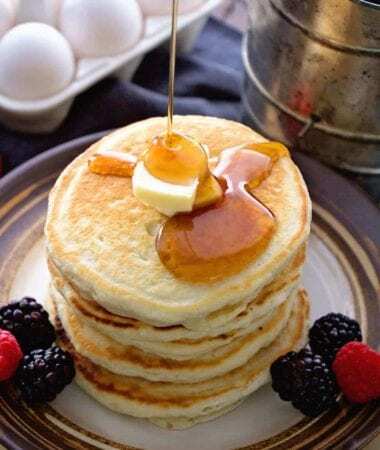 I still think it sounds good but I didn’t go with the pancakes because the hubby was gone for work and I knew I’d have to much on hand. I decided to try out these cookies. Wow. I’m sure glad I did. They were wonderful! 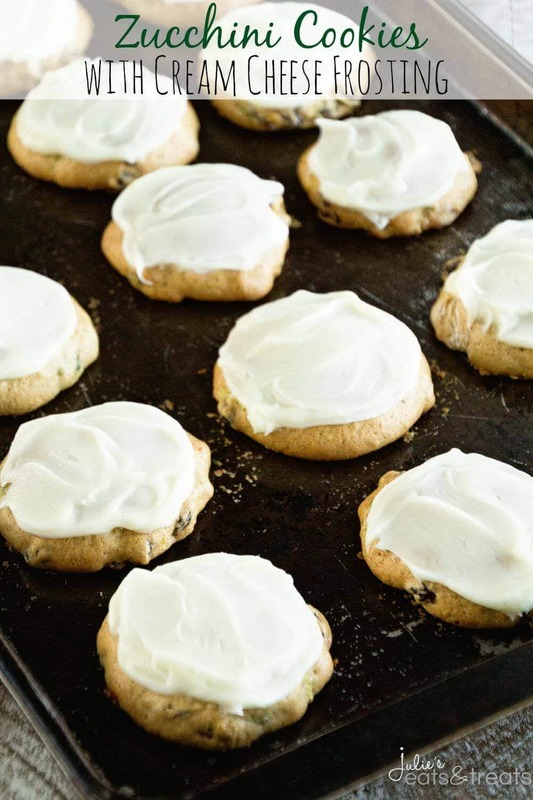 These cookies are soft even after a few days which is a must in my book plus you top them with a cream cheese frosting that hardens just enough to be perfection. They even turned my mom into a believer that you can actually do something with zucchini other then make it into bread. I’m not going to say that this whole cookie making process didn’t go without a little mishap. Back in college my professor always told us to make sure that we read our recipes through and double checked them. I remember one time none of us did this in class and we were making marshmallows. Lets just say it didn’t end pretty and there were grown students getting reprimanded for not following directions and it ended with us having to clean up and not make marshmallows. Not a pretty scene. You would think that after that incident I’d learn to read my recipes, but nope it didn’t happen. I got to the “add flour” step in the recipe and there was no flour listed. I might have panicked. Without much of a choice I just started adding flour until I thought it formed a cookie dough. I did a test cookie. Nope to runny. Added some more flour. Tested another cookie. Just perfect. Success! I’ll try and make sure all the ingredients are listed on this recipe for you! This recipe does make a lot. I mean a ton of cookies so if you don’t have an army to feed or a lot of friend and family to share with you might want to cut it in half. I shared my cookies with my sister-in-law and her family (who just had the most adorable baby boy ever! ), my brother-in-law, my co-workers, my parents, my hubby ate a ton…so you get the idea. I think you could easily freeze these for later also. I added raisins to my cookies but feel free to throw in some chocolate chips instead if you aren’t a raisin fan. Enjoy! Preheat oven to 350 degrees. Beat eggs until light and fluffy. Add oil, sugars, zucchini and vanilla. Mix well. In a separate bowl combine flour, soda, baking powder, baking soda, cinnamon and salt. Add to egg mixture and mix well. Add raisins. Drop onto greased baking sheet. Baked 10-12 minutes or until edges start to turn golden brown. Cool completely and the frost. For the frosting cream butter and cream cheese. Add vanilla. Mix in powdered sugar until the right consistency. Add more if needed. Frost cookies. 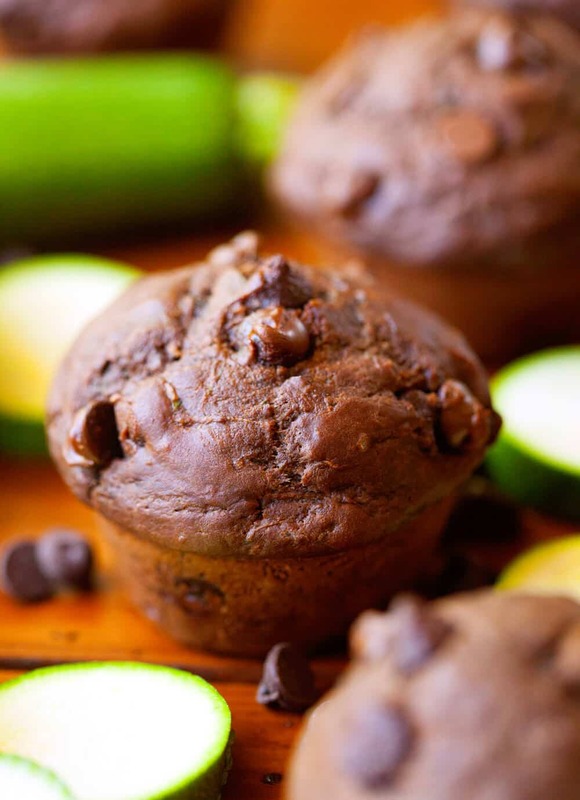 This is the perfect way to get kids to eat zucchini! Thanks for sharing this tasty and unique recipe. Yum! Thanks so much for linking this up this week to Made it on Monday! 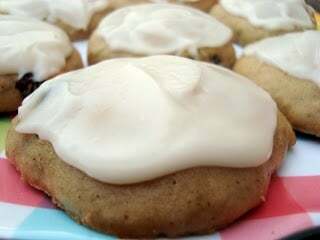 Because you have Zucchini in cookie form WITH the most amazing cream cheese icing recipe, I will attempt! 🙂 I’m not a huge fan of Zucchini but anything covered in this icing is worth a shot! 🙂 They look fantastic!! Those cookies look so moist and yummy. Great way to use squash! Come over and visit us today. We have a wonderful chicken and dumpling recipe. Those cookies look so delicious! 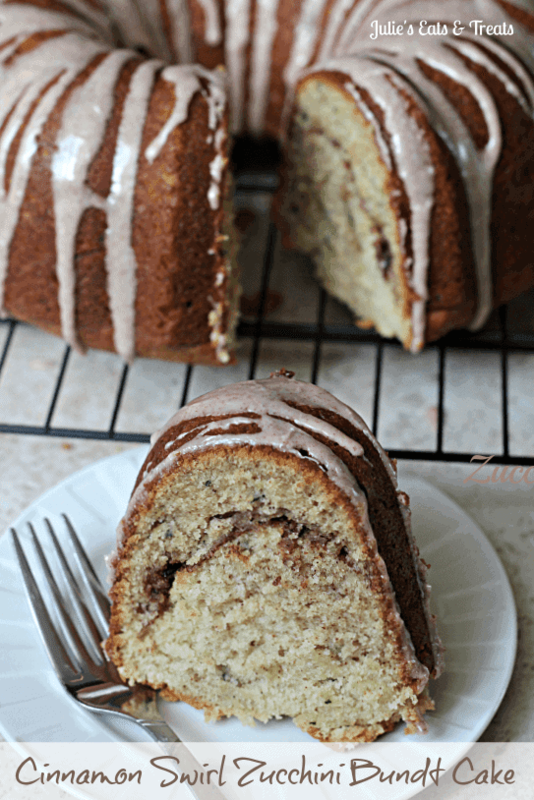 Don’t you just love using the Summer zucchini for sweets? I just liked you on Facebook. Hope you have a good day, Julie! I had the same zucchini predicament last week! These look great and I bet they were so soft and moist. I’ve been making zucchini bread for years, but I’m definitely going to try your recipe. Who doesn’t love cream cheese frosting? The ingredient list looks healthy too, especially if I use a whole grain flour and organic eggs, which I usually do anyway. I’ll be making these with my kids real soon. Thanks for such a great recipe and idea! Would like to try these great looking cookies – since there’s only my husband and I, would like to half the recipe. How would I half the 3 eggs? Janet a large egg usually is about 3 Tbsp so if you measured out 1 1/2 Tbsp you should have about 1/2 of an egg. I have zucchini in my garden just waiting to be picked. I love the idea of making cookies with them too! These look incredible! Love how soft and pillowy these cookies are! They look amazing and the perfect way to use up some zucchini! These look like a delicious twist on oatmeal raisin cookies! I don’t read through the recipe way too often and it has gotten me in trouble many times! I love this way of using zucchini!! Very creative and I think you should still try pancakes, I think they sound good! Never have I ever put zucchini in a cookie. Carrots, but not zucchini. Guess I need to work on that! These look SO good! Perfect for using up summer zucchini. Can’t wait to try this recipe.